Kimono for a young girl with lily flowers, Silk crepe dyed and painted with colours and gold highlights Japan, early Shôwa (1926-1989), Tôkyô Sugawara Keiko Donation Marian Gérard © Baur Foundation, Geneva. In France, around the 1920s, a great number of magazines written for and about women were founded. 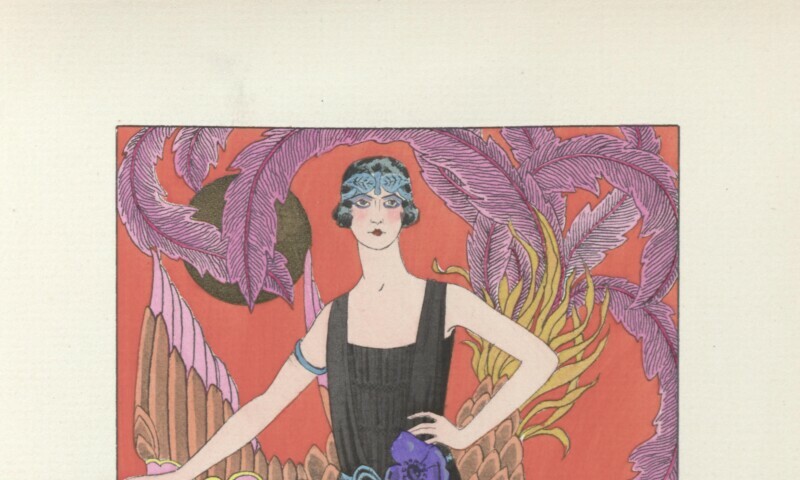 The Gazette du bon ton, art, modes et frivolités was one of the best to reflect the period, but there were also Modes et manières d’aujourd’hui, Costumes parisiens, Journal des dames et des modes, the French version of Vogue and Les Modes, for example. They offered advice on different topics, such as home decoration, lifestyles, the theatre, fashionable holiday resorts, and of course fashion, all abundantly illustrated with colour plates. These were generally created from a drawing whose outlines were first engraved, then printed with black ink. The areas within the outlines were then filled in with watercolours or gouaches, applied using a stencil. The composition of the images, the different stages of their production, and the themes developed all strongly resemble the Japanese woodblock prints by which they were inspired. The Baur Foundation in Geneva has a sufficiently ample and representative collection of Asian textiles to provide a comparison with the Western fashions of this period. The remarkable encounter of the two has given rise to an exhibition and catalogue in which designs by Parisian creators are displayed alongside pieces of contemporary Far Eastern textiles. The accompanying book makes it possible also to publish the donations of Japanese kimonos and other clothes received by the Baur Foundation – including the Sato Mariko (2008) and Sugawara Keiko (2015) donations – but also certain Chinese textiles that add to the richness of the institution’s collections.